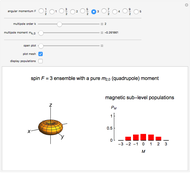 An ensemble of spin-polarized atoms is characterized by its density matrix , which can be decomposed into atomic multipole moments that transform under rotations as irreducible tensors of rank . 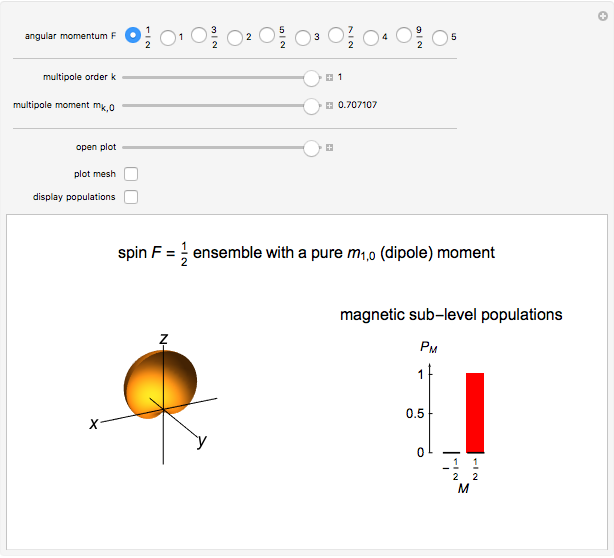 This Demonstration gives a graphical visualization of the longitudinal multipole moments (left) and of the corresponding populations of the magnetic sublevels (right). that represents the probability of finding the ensemble in the stretched state when the quantization axis is oriented along ( , ). where the are irreducible tensor operators with rank and . 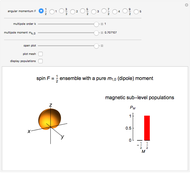 The , called multipole moments or state multipoles, transform under rotations as the spherical harmonics The moments are called longitudinal moments, while the moments are called transverse moments or coherences. An ensemble of particles with spin can have multipole moments of rank . 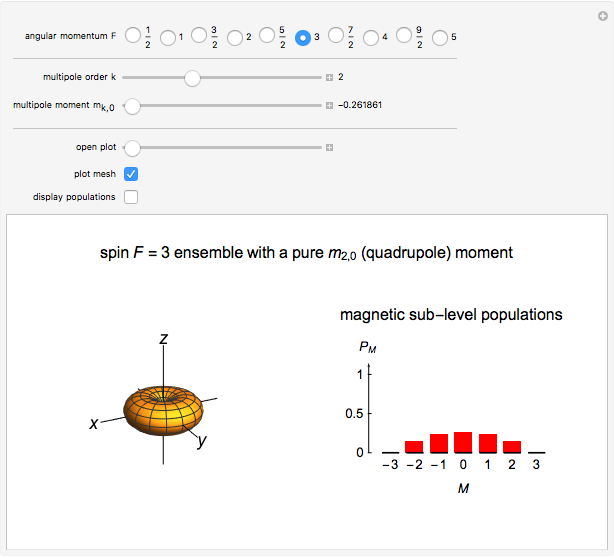 This Demonstration visualizes the probability surfaces of ensembles with spin that have a pure longitudinal multipole moment in addition to the (trivial) monopole moment of value . You can vary the value of between its extreme values, and the corresponding populations of the sublevel populations are shown as vertical bars. 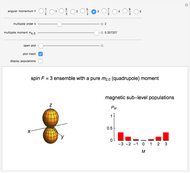 An ensemble with nonvanishing multipole moments is said to be oriented, while an ensemble with non-vanishing multipole moments is said to be aligned. Gianni Di Domenico (Université de Neuchâtel) and Antoine Weis (Université de Fribourg) "Polarized Atoms Visualized by Multipole Moments"